Bob Lutz's latest blog post on the Chevy Volt bashers finds him disappointed that a Conservative Icon like Charles Krauthammer would stoop to joining in with heaping lies upon the Chevy Volt. Bob Lutz, formerly the Chairman of General Motors, and father of the Chevy Volt, has found cruel disappointment in his quest to get right wing commentators to stop bashing the Volt. The last few months as the chorus of right wing Chevy Volt bashers has grown, Lutz has penned a series of blog posts on Forbes explaining how the bashers are wrong-headeded, and asking them to stop the bashing. In his latest post Lutz explains he has expended a lot of effort the last few months, hoping he might get "the chief disseminators of misinformation (Rush Limbaugh, Bill O’Reilly, et al)" to realize the error of their ways and say something like “Wow! I guess I didn’t realize that no Volt, (other than ones deliberately destroyed), ever showed as much as a wisp of smoke! I guess I had better retune my rhetoric!” Along the way he has called on the Volt bashers to be truthful, relating his own debunking of Volt misinformation, and to point out that Volt bashing by right wingers is harming American workers. The cruel disappointment came upon reading a piece last weekend by Charles Krauthammer, whom Lutz describes as his "hero-figure on the Right." Lutz was enjoying Krauthammer's piece until it turned to, well, bashing the Volt. Lutz describes Krauthammer as smart, well informed, and he must be well informed as to the truth. Therefore, Lutz deduces, that for Krauthammer to persist in "the myth of Volt combustibility and Obama-conception of the [Chevy Volt]" cannot be an error, and that Krauthammer (and other "icons of conservatism") must be purposely lying about the Chevy Volt. If Conservatism is about sticking to Truth, then the telling of a "momentarily convenient fiction" (the lies about the Volt) is damaging the credibility of Conservatism, says Lutz. Since Lutz was so dissillusioned by Krauthammer's piece, let's take a look at what he had to say. The title is "Obama’s oil flimflam" and appears in the Washington Post. The first part isn't terribly important to our discussion here. It presents the right wing argument about oil policies, the Keystone XL pipeline, and why we should "Drill Baby Drill" to solve oil problems. We have already gone over the contrast between those ideas and Obama's recent policy statements. Obama's stance is much more rational and truthful, there is very little remaining oil reserves in the U.S. and it's folly to think "Drill Baby Drill" is anything but a short sighted short term solution. Instead Obama's policy is to focus on developing new energy resources rather than continue dependence on fossil fuels. However, the bit we want to get to is towards the end when Krauthammer starts bashing Obama's policies. He starts by invoking the ghost of Solyndra, and then claiming that "government-subsidized Ener1" is collapsing. Truth is that Ener1 went into bankruptcy in January, but the process was foreseen to be straightforward allowing Ener1 to re-emerge from bankruptcy soon. Indeed, a recent review of Ener1's SEC filings indicates the company will shortly exit from bankruptcy and resume normal business operation. Yes, the Ener1 bankruptcy was rather inconvenient, it doesn't portray well upon the Obama Administration policies, but it is hardly a "collapse" that will erase Ener1 from the face of the earth. Ener1's bankruptcy may well turn out to be a hiccup in their business plan rather than the disaster Krauthammer seems to want us to think it is. Next Krauthammer referred to "the flammable Chevy Volt" and GM's production suspension. 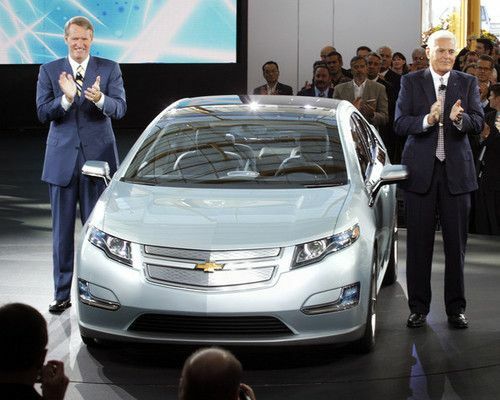 We recently covered statements made by GM's CEO Dan Akerson about the Chevy Volt production slowdown, and other items. It is almost certainly correct that, if GM were selling Volt's at a fast enough pace, the production slowdown (which started yesterday) would be unnecessary. It would be interesting to learn what's behind the lack of demand for the Volt, considering the large number awards won by the car, and the highly enthusiastic Volt owners. However, to call the Volt "flammable" is completely untrue. Yet Krauthammer, and other Volt bashing right wing pundit's, repeatedly describe the Volt with that word. Fact is that there was one and only one fire of a Chevy Volt. That one Chevy Volt burned three weeks after an NHTSA crash test. The NHTSA did a thorough forensic investigation that included conducting two more crash tests in September 2011, in an attempt to replicate the fire, but were unable to do so, demonstrating that the flaw causing the original fire was extremely difficult to produce. In November 2011 the NHTSA managed to force two Chevy Volt battery packs to catch fire during subsequent testing. In January 2012 GM announced a fix for the flaw, and recently began the process to install that fix into the Volt fleet. One car catching fire three weeks following a crash test hardly sounds like a dangerously flammable car. Yet the right wing punditry are going full bore pressing the flammability of the Volt, why? Are they also as worried about the 250,000 or so car fires that occur every year? Some vehicle models have known flaws that cause them to spontaneously burst into flames while being driven down the road. At least this Chevy Volt flaw gives the occupants three weeks to get to a safe distance, unlike those cars that spontaneously catch fire. Where is the outrage over the common car fire and the many deaths occurring each year in burning cars? Why is the outrage focused so inappropriately upon the Volt? What Lutz has done is demonstrate how the flaws in a piece of writing undermine the whole piece. By doing so Lutz calls into question the credibility of the pundits who bash the Obama Administration on not just the Chevy Volt, but the various other things Obama is being bashed over. In other words, if an esteemed Conservative like Krauthammer can be so wrong about Ener1 and the Chevy Volt, what else are they wrong about? Conservative pundits are well versed in constructing arguments that appear to be well reasoned, and to state their arguments with conviction. Perhaps the casual reader who doesn't know all the details being argued might read the convincing tone of the writer, the apparently soundly reasoned argument, and come away convinced of whatever position the pundit wrote. However in this case we see there was a paragraph in the middle, a paragraph which contained falsehood, untruth, and incorrectness. The falsehood sits there like a cinder in the middle of Krauthammer's piece, weakening the argument by the existence of untruthfulness. The question is, how often does this happen? How often does a pundit (of any stripe) put together an essay on a particular point of view, but slip in a few lies. The utterance of lies should undermine the authority of whomever speaks them. Unfortunately the current climate seems to accommodating of pundits who lie, but doesn't that do a disservice to us all? What Lutz seems unable to understand is that politics = lies. Anyone who believes anything that comes out of a politican's or their supporting whack jobs' (aka "pundits") mouths should consider investing in beachfront property in Utah for retirement. I also wonder how much Lutz is getting for his service as a Volt PR man. He seems to be doing pretty well getting himself repeatedly in the press to talk about the car that won't sell. I more often respect the opinions of both Lutz, and Krauthammer. However, I would like to see Lutz address the real issue for a chnage; as to why Volt sales are so low - COST. In my opinion, his attacks on the Volt attacks also hides a more simple truth, whcih Krauthammer should have pounced on as well. The Volt is too expensive. Any vehicle that cannot be sold without government (read taxpayers) subsidies doesn't deserve to stay afloat no matter how cool the propulsion system is. The development money might have been better spent developing high-volume, lightweight body structures; and Lutz deep down knows that. Lutz can afford jet fuel for crying out loud, so I can see how easy he dismisses the cost issue to the average American worker. Still, I agree with his upset on the single Volt fire, which was mismanaged in my opinion by NHTSA; and Krauthammer is a better journalist than that; and he should rectify that portion of his article. OK, this time I double checked Krauthammer's article. The only wrong was the use of a single word, "flammable," next to the words, Chevy Volt. In truth, though, the car DID IN FACT catch fire, which means the design was not as robust as it should have been. And NHTSA did IN FACT screw up by not depowering the battery post crash test. Cheap shot by the Krautster? Perhaps, but read the other 99% of his article. It is right on. And keep in mind that Lutz gets paid a handsome sum of money to be the mouthpiece, which he is very good at. Reason is, everybody in GM has to have their chutzpah button disabled, because the company is still owned in part by the U.S. government. So, get off the high horse of anti-conservatism. The left acts and writes no differently, as they did by shooting down the Keystone pipeline which would have enabled a host of shovel-ready jobs. If we don't pump it and use it, the Canadians will and sell it to the Chinese. Keystone is not as clean as it might appear. The opposition to the pipeline is also coming from the Canadian political right. They want to keep the oil and refine it in Alberta then ship the gasoline to Ontario and other parts of Canada that currently import both raw crude and gasoline from the gulf. Currently Canadians pay about $1 more per gallon than the average US price.. This is at least in part due to the tax subsidies in the US to refiners and scale issues in Canada but the optics are horrible. This difference is not sitting well with the average Canadian voter. The keystone pipeline may not be built period, regardless of whoever is president. I've actually yet to see a real analysis of these "subsidies" for oil everyone always talks about. I've seen papers from various environmental groups showing tax WRITEOFFS and calling them "subsidies" (a cost of business is a write-off, I don't care if you're the Sierra Club or Exxon). Unlike "green energy" (including the ultra-dubious corn ethanol), which gets money directly from the government as grants and incentives. Personally, I'd like to see government get out of all of this entirely and stop giving or loaning money to private enterprise for any reason or any cause. If whatever they're doing is so great, they'll succeed on their own. It worked pre-WWII, it can work now.